Remember to bloom when you’re ready with Tulianna and Alejandra Garces’ handmade necklace. Orchids know they're worth the wait, sprouting their first petals after five to seven years. But once they do bloom, they can live happily for a decades. 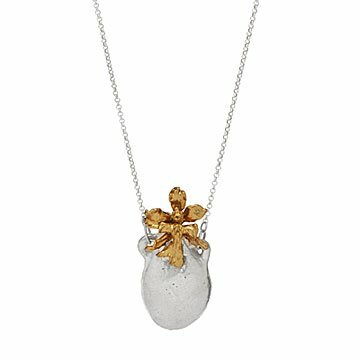 Remember to take life at your pace with this beautiful necklace by mother-daughter designers Tulianna and Alejandra Garces. They hand-cast the intricate piece from sustainable plant-based resin. Once it's complete, they dip the flower in 24-karat gold and string it from a 24-inch gold-plated chain. It's a weighty "wow" piece that's sure to delight a gardener, outdoor lover, or friend whose happiness is always blooming. Handmade in Colombia. 2.1" L x 1.1" W x .6" W Chain: 18"